Stress is associated with a number of physical conditions including back-pain, susceptibility to viruses, chronic fatigue syndrome and autoimmune disease. Richard O'Connor. author of the book Undoing Perpetual Stress : The Missing Connection Between Depression, Anxiety and 21st Century Illness, argues that our bodies are not designed to cope with the stresses of the modern world. More at: Stress in the 21st Century. This book goes beyond any other personality system or four quadrant model currently available by integrating a century old personality system with breakthroughs in brain science and neuroplasticity. More at: Who Are You Meant To Be? Werbach covers a range of issues in his book, from ways in which business electricity costs could be reduced to the need to conduct business in a transparent manner. 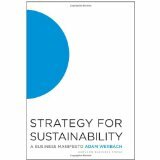 More at: Strategy for Sustainability: A Business Manifesto. Human Resource Management provides a thorough and comprehensive treatment of all the key aspects of HRM. Shortened version of Human Resource Management providing a concise analysis of the subject for non-specialists and one-semester courses. Daniel Defoe - The Author of "Robinson Crusoe"
The Community Practicing "Enlightened Power"
Why is HRM increasingly important? Sales and Marketing Strategies for Era 3: How To Leverage Value To Win-And Keep-Profitable Customers.